We have another pretty wedding to share from late summer (with another gorgeous color palette too). Our last post highlighted pales hues of late spring apricots and ivories punctuated with deep color. 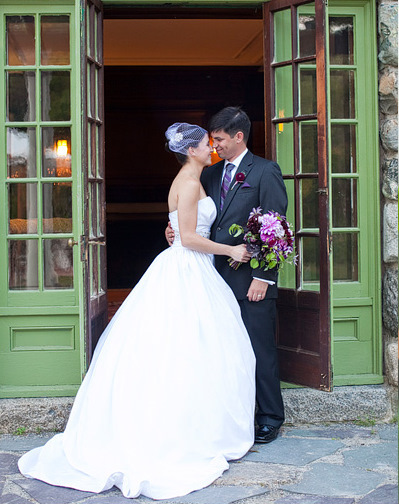 This wedding, was saturated with late summer colors all the way through! Bride's Bouquet. Meghann Gregory Photography. 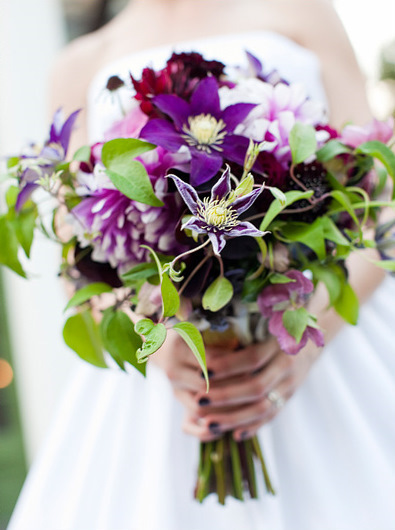 Apryl created this gorgeous bouquet using late summer purple clematis, pink and white-tipped dahlias, burgundy dahlias, purple-black scabiosa, and dusty purple-pink hellebore. We’re also super psyched because this lovely photo by Meghann Gregory Photography of the bouquet is going to be part of a bouquet feature in Bride’s Boston Spring/Summer issue! The happy couple at Willowdale. Meghann Gregory Photography. Meghann took this wonderful photo of the couple – all of the photos of the two of them are like this – so happy, loving, and excited to be there together. Groom's boutonniere. Meghann Gregory Photography. 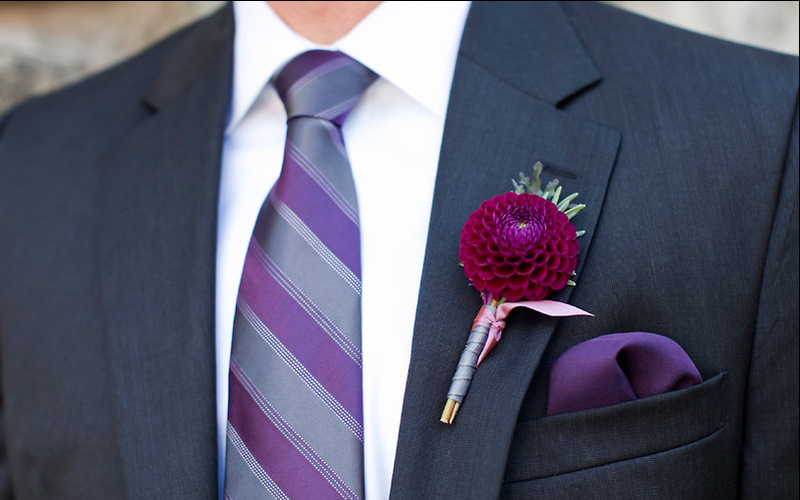 I love this photo of the groom’s boutonniere because it really shows the play of the color palette, different tonal purples, silvers, and burgundy. 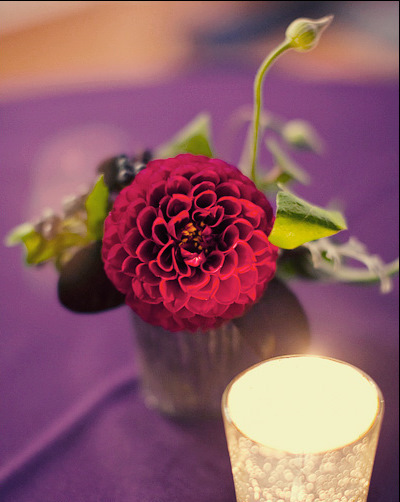 We loved these little pincushion style dahlias, just perfect size-wise for a boutonniere. Entry Arrangement. Meghann Gregory Photography. Above is the arrangement for the entry at Willowdale. We found a lovely large mercury glass vase (they can be a little difficult to find sometimes!) and filled it with long arching branches of seeded eucalyptus, ornamental grasses, purple smokebush, silvery antique purple-green hydrangea, sterling roses, burgundy dahlias, and pink dahlias. A fun, slightly wild arrangement! Petite bud vase. Meghann Gregory Photography. 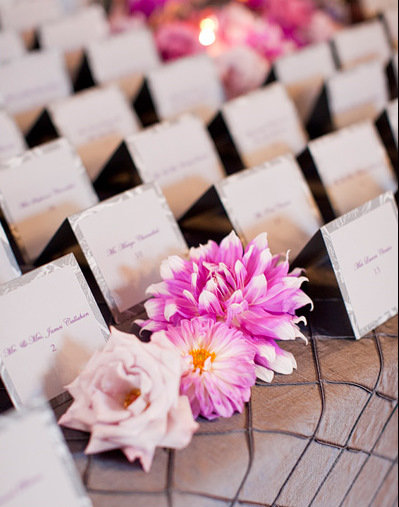 Meghann captured a lot of photos of the small little details, which we love! 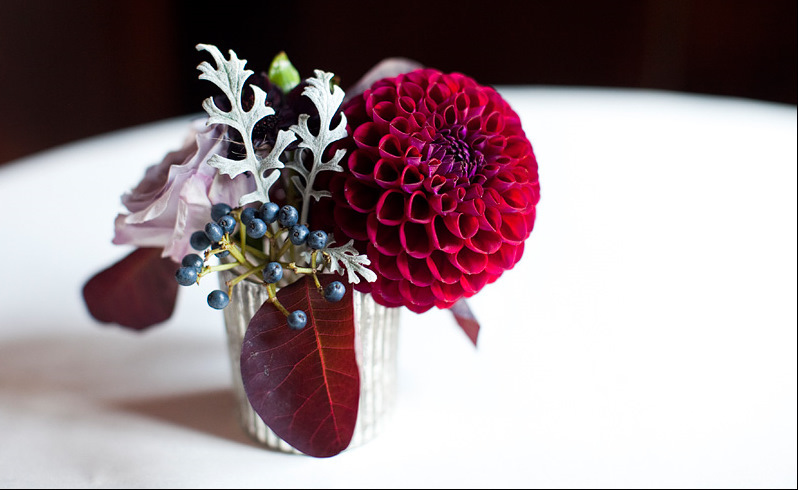 Here one of the small bud vases on the cocktail tables, filled with a dahlia, clematis buds, and privet berry. Placecard Table and Blossoms. Meghann Gregory Photography. This is a pretty and simple option for couples who want a bit of decoration on a place card table but might not have room for a whole large arrangement. It works particularly well here because of the pin-tucked pewter table linen and beautifully handmade placecards. Table design. Meghann Gregory Photography. The tables in the tent at Willowdale feature two styles of decor. Seen above at Table 1 is a lantern and bud vase style. Square dark pewter lanterns were surrounded by three tall mercury glass bud vases and five mercury glass votive for a super glow-y look. 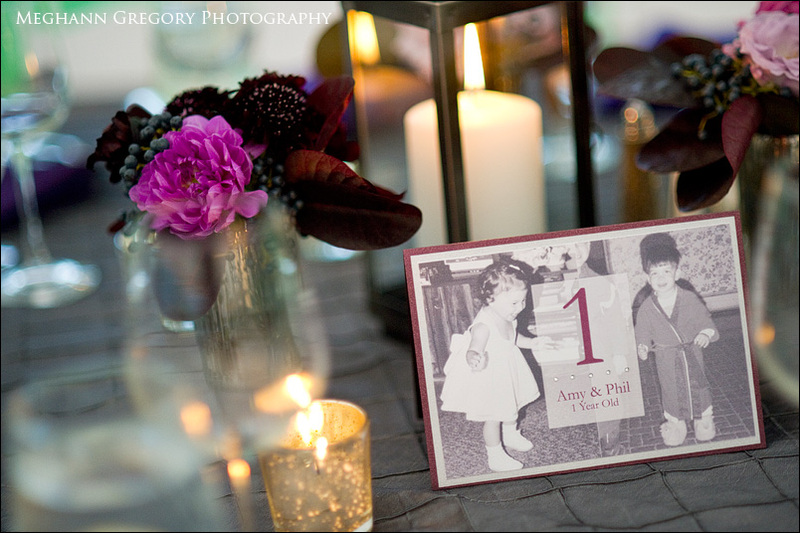 This photo also gives a nice view of the couple’s create table numbers: each number corresponded with photos of the couple when they were that age. Subtle touches like giving the photos a black and white, sepia-toned treatment softens the photos and helped them blend stylistically with the table design. Centerpiece design. Meghann Gregory Photography. 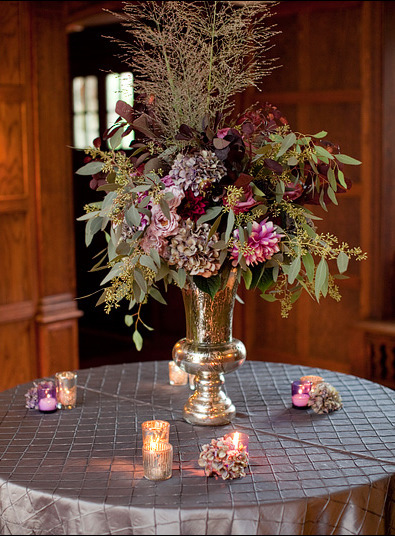 The other table design featured a low pewter urn filled with silvery antique lavender hydrangea, burgundy dahlias, and touches of pink and deep purple. 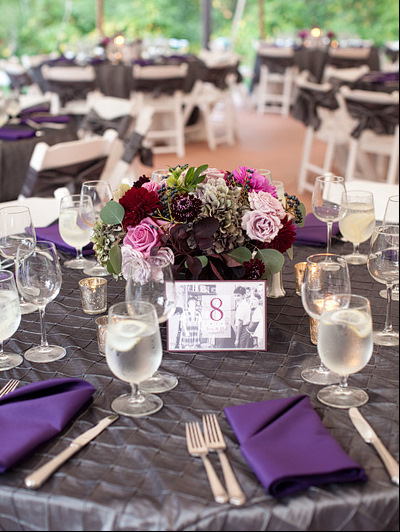 Purple napkins gave an extra accent of color. Bud vase. Meghann Gregory Photography. Our final photo to share, again of a sweet little bud vase. Thank you to Meghann for all of these lovely details and to Amy and Phil for letting us help create something beautiful for your day!